Scribner Book Company, 9781416575436, 320pp. Grayson Donald, seventeen years old, has just hanged himself from a basketball hoop next to a playground in Centreville, North Virginia (NoVA). The question is, Why? In this incisive dissection of the author's hometown, James Boice scratches its shiny suburban surface to reveal a place formed from "a cloud that slid west and met with the humidity and spent buckshot cartridges and Civil War bones clad in blue and gray to create concrete and vinyl siding and front yards laid in chunks, child care centers and video rental places." An exciting new voice in fiction, James Boice blends sharp social observations with dark humor and remarkable prose. In both passing glimpses and intimate interior monologues, we come to know Grayson's family, his fellow students, his neighbors, and many who knew him only slightly, if at all. A portrait of a town emerges that renders Grayson's suicide both devastating and inevitable. 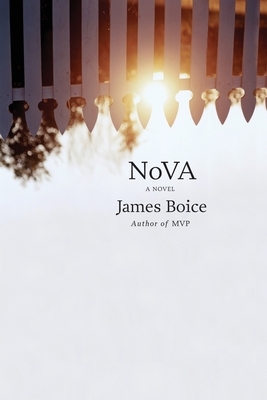 "NoVA" is a unique and fascinating depiction of the American suburb.